Homes in Aberdeen were left with low power today after an issue with a fuse at a substation. An estimated 60 north-east properties have been affected by power cuts this morning. Around 130 properties in the north-east are without power this afternoon. Power cuts left almost 1,000 properties in the north-east without power today. Almost 300 properties in the north-east have been cut off from the grid following a series of power cuts today. Nearly 180 homes were left without power today. Power has been restored to 91 homes in the north-east following an outage. More than 200 homes in Aberdeen were without power today. More than 7,000 north-east properties are without power this afternoon. A power cut has hit a north-east village this morning. A powercut left 2,000 north-east residents without power. More than 1,000 homes in Aberdeen lost power this morning. A power cut is affecting north-east properties this morning. More than 1,200 Aberdeen homes were left without electricity today after a power cut. More than 1,000 homes were left without power in the Granite City. More than 30 properties in the south of the city were today affected by a power cut. A North-east school is appealing for parents to collect their children as soon as possible after a power outage. A post on the Aberdeenshire Council website says Onye School has now been closed to everyone after a power cut, but it said children will be looked after until arrangements can be made for their collection. 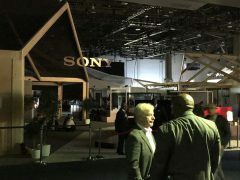 CES, the centre of the electronics world this week, has been hit by a major power outage.